CoQ10 benefits are largely unknown to most people and medical practitioners. Foods high in coq10, and Coq10 supplements are actually needed by patients on certain classes of heart medications. Let’s examine this nutrient and its vital functions. Coenzyme Q10 called CoQ10 for short is a fat-soluble essential nutrient found in the mitochondria of each of your cells. It is involved in metabolic energy production by shuttling electrons through the electron transport chain. It is also a powerful antioxidant. It is also known as also known as ubiquinone, ubidecarenone, or ubiquinol. 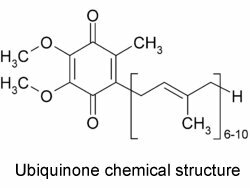 Ubiquinol is its active, and some feel, more bioavailable form. It remains in the system much longer and is more effective in increasing coenzyme Q10 concentrations in the heart where it is needed. For this reason the ubiquinal would provide more of the benefits of coenzyme q10 than other coq10 supplements. Some people especially as they get older have more trouble converting nutrients into their active forms, and so it may make sense to supplement with the active form saving the body from the extra metabolic step needed to convert it. Levels of coq10 in the body can be checked by a blood test to see if they are in the reference range. This will show whether you need to supplement then, or if you are supplementing, whether the coq10 supplements you are taking are being properly absorbed. Natural production of coq10 in the body declines quite a bit with age (up to 70%+ ). When an older person is also on statin drugs which also deplete coq10 this can result in a serious depletion of contractile energy in the heart! Researchers at The Baker Institute in Melbourne Australia are using Coq10 supplements prior to heart surgery in the hopes of improving recovery times and ensuring their hearts cope better with the stress of surgery. Leading this research is Dr. Franklin Rosenfeldt, who feels that coq10 benefits could be what is needed to turn back the clock and give old hearts the cellular energy they need to resist stress, and beat more strongly giving a boost to the patient’s cardiovascular system. In Japan coq10 is prescribed by doctors for their patients who have heart disease as a safe and effective way to boost heart output not by stimulating or regulating the heartbeat like a drug, but simply by giving the heart more usable energy to work with. These foods worked into your diet provide the foundation for getting an adequate supply of coq10, but you may also need Coq10 supplements if you are older, under stress, and/or have heart disease. In all three formulations, (Kaneka QH™) is the patented form of ubiquinol that is used, so when you see the Kaneka trademark you can be sure you are getting an effective form with a high bioavailability to get the full benefits of coenzyme q10. Just some final points to consider about coq10 supplements are that if you are older and/or you are on a statin drug or other medication that is known to deplete coq10, you should supplement this nutrient. Coq10 benefits are not just a matter of having more energy or feeling better, they may indeed be a matter of life and death. This powerful antioxidant is one supplement that you shouldn’t be without!